Our 1330 square foot vacation home is located on the ninth tee of the challenge course of the Palm Valley Country Club, and features magnificent views of the nearby San Jacinto and Santa Rosa Mountains. Not only is our condo in one of the best locations in this exclusive gated community with 24-hour security, the interior provides a comfortable warm and cozy environment. Our (NON-SMOKING) single story home is conveniently located near two pools (both with Jacuzzi's). We have granite countertops in the kitchen, Italian tile floors in the kitchen and bath, Italian berber carpet in the bedrooms and living room/dining room. Neutral tan leather furniture, 4 TVs, Wireless Internet and free HBO add to the comfort. Plantation shutters adorn the sliding doors which over look the driving range. BEDROOMS & BATHS: The master suite has a CA King bed with large closets and an attached bath w/walk-in shower . A comfortable California King Memory Foam bed and pillows with custom bedding will assure a good nights rest. Each bedroom has a TV. The second bathroom has a large walk-in shower with a massaging showerhead. There are 2 single size futons to use for additional young guests which can be placed in any room. KITCHEN & LIVING ROOM: The living and dining rooms have contemporary furnishings, including: a natural leather sofa and loveseat and a matching—incredibly comfortable—leather chair, 40 inch flat screen TV with universal remote and a DVD player. Dimmer switches offer the opportunity to set lighting to match any mood. The kitchen features every conceivable convenience. DINING OPTIONS: The gas grill on the patio outside the kitchen allows you to choose to stay at home and prepare a home cooked meal for those nights. All appliances and amenities including a Keurig Coffee Maker. The Palm Valley Country Club offers two 18-hole courses designed by Ted Robinson, one championship par 72 course and a challenge courses, par 63, 16 lighted tennis courts, and a full Spa facility. We are the owners (Sam, Wendy, Gianna and Mia) - we live in San Diego approximately 2 hours from Palm Desert. We use this Palm Valley property as a 2nd home in the non-rental season and therefore keep it in very nice condition and well stocked for your vacation! Come and enjoy our recently remodeled baths and flooring! 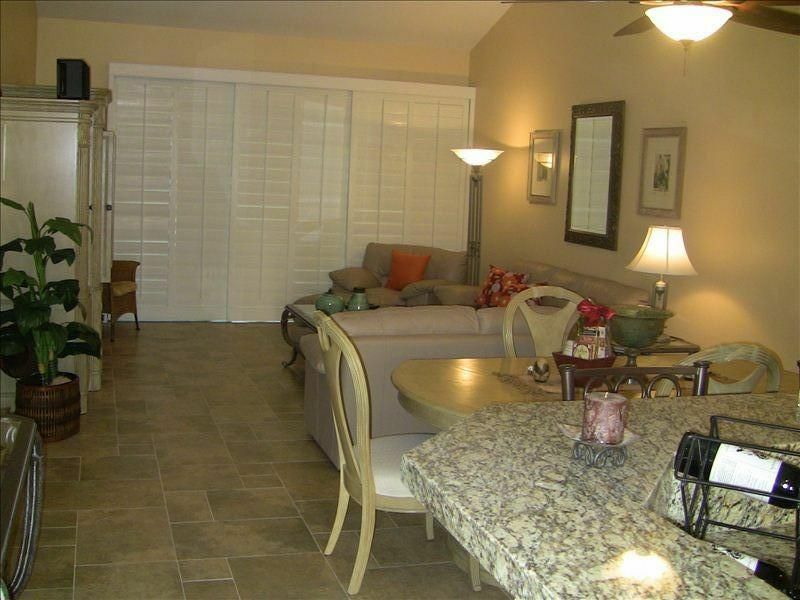 We love the desert and this unit is perfect for our home away from home. Palm Valley Country Club is the most beautiful complex in the area. We keep a well maintained unit. The wonderful people, location, pools and surroundings offer an excellent place to relax and enjoy the desert. Both the Master and 2nd Bathrooms fully upgraded w/tile, travertine and granite. Both have walk-in showers with new modern plumbing and shower heads. Living room and master face East, kitchen faces West. New 2-stage Heater and A/C just installed. This was the perfect condo to rent for a very special Thanksgiving getaway. From the fully stocked kitchen which is very easy to work in and the generous seating within the unit, we were able to prepare a meal to share with friends. The bedrooms have lovely remodeled ensuites and are separated by the two bathrooms between so very private and comfortable. Will definitely recommend and hope to stay again next time we are able to travel to enjoy the beautiful settings and excellent golf facilities.